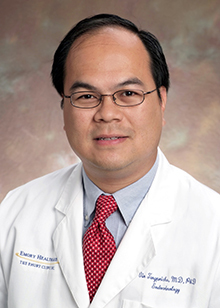 ORLANDO – Vin Tangpricha, MD, PhD, associate professor of medicine and director of the Endocrinology Fellowship Program at Emory University School of Medicine, is being honored by the American Association of Clinical Endocrinologists (AACE) with the Outstanding Service Award for the Promotion of Endocrine Health of an Underserved Population. The Outstanding Service Award is presented to an individual for outstanding contributions to the endocrine care, health and service to an underserved population in the United States or abroad via leadership, long-term commitment, vision, innovation and impact. Tangpricha has a special interest in the hormonal treatment of transgender individuals. He is a highly sought-after speaker on transgender issues, having cared for more than 400 people with transgender and gender non-conforming identity. Tangpricha first developed an interest in the endocrine care of transgender patients 15 years ago during his residency and fellowship. In 2003, after careful investigation of the accepted endocrine protocols for treating transgender patients at that time, he published a review on the topic of transgender care in Endocrine Practice. Tangpricha is a co-investigator with colleagues at Emory’s Rollins School of Public Health on two federally-funded grants to explore the long-term health of transgender people. He remains active internationally in the field of transgender by serving as the AACE liaison for the revised Transgender Guidelines by the Endocrine Society to be released in 2016. He also serves on the board of the World Professional Association for Transgender Health (WPATH). He was appointed as a member of the Atlanta Hawks Diversity and Inclusion Committee in LGBT issues. Tangpricha’s award will be presented this week during the AACE's 25th Annual Scientific & Clinical Congress meeting in Orlando, Fla.